All it took was a beautiful, sunny afternoon and a little bit of me time. A chance to chill out, surrounded by campervans and maybe a glass of wine and I began to think of an idea… glamping in a campervan! “Having a child will not change us”. These are the immortal words so many of us mutter, safe in the knowledge that you own a cat who (granted, does eat EXACTLY the same food for every meal, but nevertheless requires feeding…) has been given two meals a day without fail and the Yucca plant has enjoyed three whole years of watering. A baby requires much the same discipline, right? So we’ll not change. Nope, not us. Fast forward a few years and things HAVE changed. Oh yes! We are not rocking up at home around 2am, armed with a pizza very often these days. Nor are we crawling out of bed around midday and homing towards the nearest café. We now have two boys, a full appreciation for early morning sun and an exercise regime, from constantly lifting them away from hazards, that’s quite demanding. It makes any previous gym circuit pale into insignificance! So, change has been good. We are now much more healthy and organised. OK then… organised… You have to be, when travelling any distance requires logistics expertise and packhorse strength, as you lug unbelievable amounts of equipment to and from the car. Also, our holidays took on a whole new meaning. For a while we tried to carry on with the flights and apartment routine but the travel was a stress, drinking the baby’s milk at security wasn’t our first choice of aperitif and often the set up wasn’t ideal for the kids when we got there. We’d put up the bright blue tent – two bedrooms and a reception room – sophisticated! Then we would relax… because we could. The children all ran around until they were giddy, and we got the chance to talk rather than ‘co-ordinate’. It was an altogether more chilled affair and we loved it. We started to camp more often and always had a fantastic time. Camping really is what you make it. Liking our style and creature comforts in equal measures, we eventually decided to go for it the following year and we brought home a 1971 VW campervan, Doris. She was just superb. Peppercorn festival happened again, a few months later, and it was our first time with our own van. On the first morning, we got chatting to a guy who’d hired a camper for the weekend. Sitting in the driver’s seat of Doris, frying some eggs on the cooker under the passenger seat, he approached the window. He said he was keen to buy his own camper and was curious about the layouts of different VW’s. He just wanted to check out what would work best for his family. We then decided what would be included in our GlamperVans, basically, that was everything! Great upholstery, cookers, fridges, every conceivable piece of cutlery and crockery, heaters and, somewhat obsessively, for my partner, great stereos that connect to just about any device. 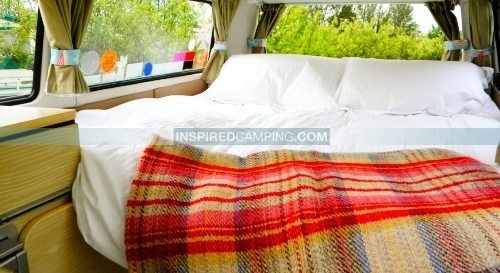 We wanted our vans to be totally luxurious and so went about ordering flooring, fabrics and crockery from Cath Kidston and Egyptian cotton bed linen with goose down duvets. We even decided to include Krups coffee makers! And the motivation? We felt like we had ‘discovered’ a new way to holiday. Our children were so excited at the thought of sleeping in the camper, we really relaxed when we ‘escaped’ and it was fantastic fun! We wanted to give other people the opportunity to enjoy that and more. Campervans give you freedom and ours give you luxury as well, and that combination is pretty hard to beat as a winning holiday formula. 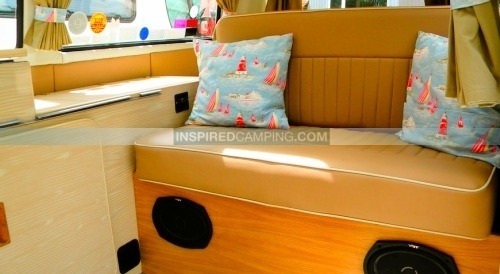 For more VW campervan glamping inspirations, take a look at our favourite glamping product company.